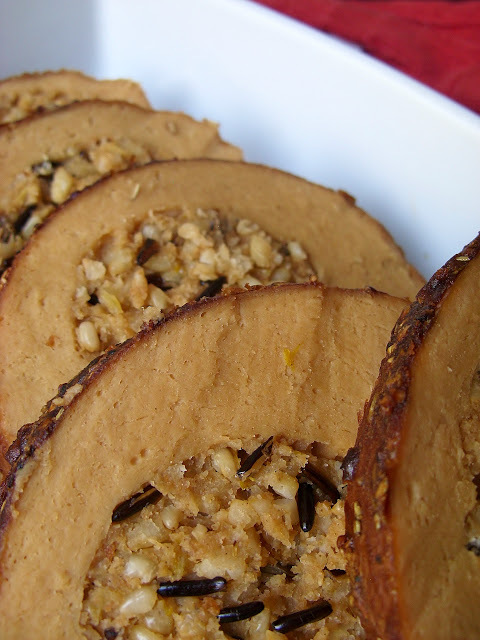 This recipe is an amazing way to level up your Tofurky. It has a dark and rich unique flavor that is intended to recreate what you get when you brine a turkey. Our process isn't really anything like the long one used to brine turkeys but the result of this recipe seems very similar. This recipe makes a thin but flavorful crust on the outside of your Tofurky that doesn't recreate a "skin" completely but it's wonderful. So you can really appreciate it. We cooked Brussels sprouts in the dark beer marinade like Betty suggested but it was not my favorite thing to ever happen. The marinade reduces over the vegetables to makes something too strong for me but I do suggest instead steaming or roasting your Brussels sprouts and then using the leftover marinade to make a gravy by adding 1 cup of vegetable broth. You can skip the flavor injector step if you want but it's kinda cool. You really should give it a try if you can. I think this photo shows you the delicious crust. And don't forget to enter to win a coupon for a Free Tofurky Feast! You ready to show this Tofurky who's boss! In a bowl, blend all your Stuffing Flavoring ingredients with a whisk until the sage has blended in completely. Now it's time to grab your strange but cool flavor injector that you may remember from such adventures as The Vegan Fried Egg and The Cajun Deep Fried Tofurky. Fill your injector with your Stuffing Flavor mix then stick the needle into your defrosted Tofurky at one of the ends Angling up so that it goes into the stuffing on the inside and will spread down throughout the stuffing. We injected all the Stuffing Flavor mix into the stuffing but you may like your stuffing a bit drier so you may want to stop at half the amount. There is a chance your your needle can get clogged by spices or pieces of Tofurky or stuffing. Just use a safety pin or warm water to clean your needle if that happens and try again. Put your defrosted Tofurky in a deep casserole dish or Dutch oven. In a mixing bowl, blend Margarine, Dijon Mustard, Rosemary, Onion Powder, Braggs, Pepper, Beer, Liquid Smoke and Flour with a whisk until there are no Flour clumps. Pour about 1/4 cup of the Rosemary Beer mix over the Tofurky with a ladle. Roll your Tofurky a few times to make sure it gets coated evenly. Put in the oven uncovered and bake for 5 minutes. Then brush another coating of Rosemary Beer mix over the top. Turn heat down to 350 and return your Tofurky to the oven uncovered. 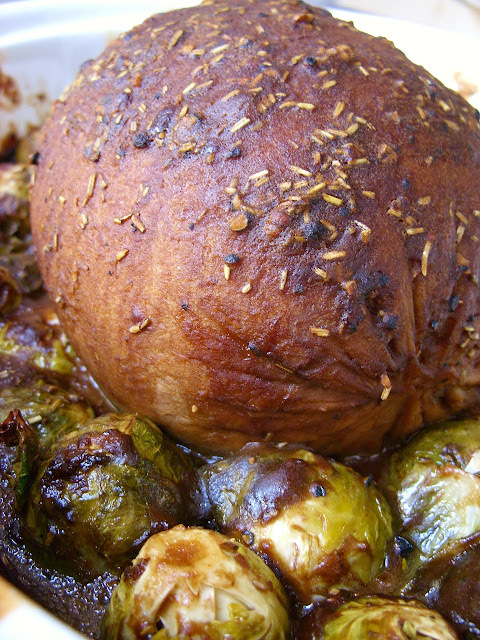 Use a ladle to pour a little more Rosemary Beer mix over the top every 5 to 10 minutes while your Tofurky roasts. You'll notice that the Rosemary Beer Mix will begin to form a crust over the Torfuky. This is a good thing and the more your either brush or pour over your Tofurkey the thicker that crust will get. You'll want to bake your Tofurky Roast for 45 minutes to one hour. You'll now it's ready when your Tofurky is golden brown and the crust is crispy. You'll have some marinade leftover that you can mix with a cup of Vegetable Broth to make a gravy. Some folks say you can serve it as is but we found it to be way to strong. Don't forget the sidekicks! One Tofurky - no matter how amazing it is - doesn't make a meal! Be sure to include classic holiday side dishes like Stuffed Acorn Squash, Macaroni and Sheese and Classic Green Bean Casserole and Candied Orange Sweet Potatoes. No Thanksgiving is complete without a Pumpkin Cheesecake! Oh.My.God. This is too much. I am dying dying DYING to make this for T-giving this year. Do you think this recipe would work with gluten-free flour or almond meal? Ya know I've so far I've only ever made pancakes with gluten -free flour and a few attempts at seiten and meatballs. I think it should work and would love to hear the results if you try it out! I loved this recipe it brought something new to a old favorite - ya know? It means a lot to me to hear that people like our project. Looking forward to jazzing up my Torfuky roast with this! Looks great! Is there a particular dark beer you recommend for this? I tried this with a Rogue Hazelnut Brown Nectar and a Sanitarium Vegie Roast that they sell here in Australia - it was awesome! Keen to try it again with a richer beer such as an Imperial Stout, or maybe something smoky like an Aecht Schlenkeler Rauchbier. Thanks again for the great recipe and great blog! Sounds amazing! I'm a recovering alcoholic and can't use the beer (it's not true that alcohol completely cooks out). Can anyone recommend a substitute? thanks! You can substitute very strongly made vegetable broth or real apple juice made from apples. It won't be exactly the same but it will be kinda close. Found this recipe this morning, and am trying it out..... I'm using Sierra Nevada stout, olive oil instead of margarine (our microwave is 'child locked' and we can't figure out how to fix it! ), fresh rosemary from the garden, and rubbed some dry Colman's mustard powder on the Tofurky for the initial 400 degree blast.... I put in some carrots, celery, squash, and portabellos for the lower oven temp of 350. It's been about 15 minutes and it smells great already! Thanks! !